Once the glasses have been manufactured and finishing touches have been added, work is far from over at RITZENHOFF. Of course, we also ensure that our product arrive right where they’re needed, when they’re needed – in more than 60 countries worldwide! RITZENHOFF customers can rely on quick delivery times and consistently high quality standards – a promise, which we have held for years, in part thanks to our own warehouse and logistics system. Our inspiration and ambition to improve everyday with excellent customer service continues to grow all the time. For one thing this means that what is ordered today is delivered tomorrow. To achieve this, we recently invested 7 million euro to build a 10,000m² logistics centre in Marsberg Essentho. Our clients benefit from our logistics centre regardless what sector they’re from, whether it’s B2B deals, promotional deals, advertising logistics, normal project operations or handling a complete sales promotion campaign. Thus, in contrast to the overall national trend, at RITZENHOFF we prefer “insourcing” to “outsourcing”. The fact that in the future all RITZENHOFF products are to be stored, picked and dispatched from the production site itself has significant benefits for both the company and the retail industry. 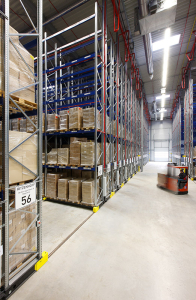 Around 16,000 pallet spaces provide ample storage capacity for both the RITZENHOFF and Maxwell & Williams brands. Thanks to this direct access, a much greater level of flexibility has now been achieved in terms of dispatching goods. All orders that are received before midday can be sent out on the same day. Furthermore, there are an additional 4,700 pallet spaces in the finished goods warehouse and 6,600 spaces in the raw glass storage centre. State-of-the-art warehouse machinery, equipped with semi-automatic mobile shelving technology allows for the optimum stock overview and extremely easy pallet-handling. Spacious picking and packing areas increase capacity to speed up dispatch processes even further. This also represents a reduction in the impact on the environment as there is no longer any need for extra journeys to external warehouses or other service providers.